In my last post, I provided a long (and depressing) list of squirrel species and subspecies facing challenging situations. The very good news is that there are quite a few people conducting research to better understand exactly why certain populations are in decline and how to most effectively reverse those trends. Not all of their results provide solutions, but each piece of information gives us better insight into what is happening and suggests ways to approach each problem. To start with the European red squirrel, we know a bit more about its population dynamics and the challenges it faces- the virus, for example, is actually a chordopox rather than a parapox (Rushton et al. 2006). While we’re still figuring out how to fight the virus itself, Rushton et al.’s (2006) research indicated that red squirrel populations decline 17-25 times faster when the disease is present than when uninfected gray squirrels are in the area, so keeping the infection from spreading in the gray squirrel population could really make a big difference to red squirrels. In terms of dealing with the gray squirrels themselves, when researchers compared trapping the animals for removal with using an immunocontraceptive to keep local populations from reproducing, they found that the method of control wasn’t as important as how wide an area was being targeted (Rushton et al. 2002). Control methods had the biggest impact on red squirrel persistence in areas that were at the edge of gray squirrel expansion- in other words, don’t wait until red squirrel populations are surrounded to take action. Another way to support red squirrels may be moving squirrels between isolated populations to ensure that rates of inbreeding are limited (Barratt et al. 1999). Translocation of animals can be a risky venture- the local population may have developed adaptations to their specific ecosystem that the newcomers won’t have, translocated animals may range outside of the intended area and be exposed to a variety of risks during their movements, and social animals may face challenges integrating into the local population. But it can also help maintain genetic diversity, re-establish extirpated populations, and restore species’ ecosystem roles. Translocation of southern fox squirrels onto islands in South Carolina was successful in establishing new populations (Dawson et al. 2009), but the researchers cautioned that the number of animals released should make allowances for losses to predators and take into account that some squirrels may have lower reproductive rates than other squirrel species. We’ve also learned more about other squirrel species that are the focus of conservation efforts. Northern flying squirrels seem particularly affected by the age structure of forests (Holloway and Smith 2011), so land management practices that leave older trees in place could be helpful, and the density of snags may be especially important. Mahan et al. (2010) also suggested that white-tailed deer, which feed on conifers during winter periods and can kill trees if they graze too intensively, should be managed to prevent local populations from limiting conifer tree recruitment. Since sometimes there are conflicting conservation priorities, for example northern flying squirrels and red-cockaded woodpeckers which both nest in cavities, Borgo et al. (2010) investigated whether trapping squirrels for removal made any appreciable difference in nest success for woodpeckers- their results suggest that adding nest boxes for squirrels to use may be a better strategy since squirrel trapping would need to cover a large area in order to be really effective. 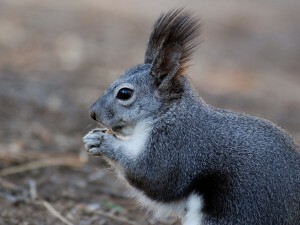 The issue of connectivity remains central to squirrel conservation in a variety of habitats. When researchers tracked a number of dispersing juvenile Franklin’s ground squirrels, they found that, while one male successfully crossed at least 4 roads to get to a new colony, at least two other animals were turned back by the barrier of a road (Martin and Heske 2005). Maintaining safe corridors for movement between colonies could be very important in connecting populations, whether on the ground or at an arboreal level. The tassle-eared squirrel is dependent on ponderosa pine habitat with good canopy for moving between locations- management decisions to suppress fires and allow logging changed forest age structures and fragmented larger systems, making it more difficult for squirrel populations to find the habitat they need and maintain contact with other areas (Prather et al. 2006). So we have a better sense of what makes systems work for squirrels: connectivity; forests with older, larger trees or snags; protection from disease. But we also know that some squirrels are facing some pretty tough odds- is there a way for us to help them out? In my final post of the month, I’ll investigate the options we have for supporting, directly and indirectly, squirrel conservation. Barratt EM, Gurnell J, Malarky G, Deaville R, Bruford MW. 1999. Genetic structure of fragmented populations of red squirrel (Sciurus vulgaris) in the UK. Mol. Ecol. 8:S55–S63. Borgo JS, Conover MR, Conner LM. 2010. Flying squirrel removal does not reduce their use of simulated red-cockaded woodpecker nest clusters. Southeast. Nat. 9:813–820. Dawson JR, Lee JC, Osborn DA, Miller KV. 2009. Survival, movements and habitat use of translocated southern fox squirrels. Am. Midl. Nat. 162:335–345. Holloway GL, Smith WP. 2011. A meta-analysis of forest age and structure effects on northern flying squirrel densities. J. Wildl. Manag. 75:668–674. Mahan CG, Bishop JA, Steele MA, Turner G, Myers WL. 2010. Habitat characteristics and revised gap landscape analysis for the northern flying squirrel (Glaucomys sabrinus), a state endangered species in Pennsylvania. Am. Midl. Nat. 164:283–295. Martin JM, Heske EJ. 2005. Juvenile dispersal of Franklin’s ground squirrel (Spermophilus franklinii) from a prairie “island.” Am. Midl. Nat. 153:444–449. Prather JW, Dodd NL, Dickson BG, Hampton HM, Xu Y, Aumack EN, Sisk TD. 2006. Landscape models to predict the influence of forest structure on tassel-eared squirrel populations. J. Wildl. Manag. 70:723–731. Rushton SP, Gurnell J, Lurz PWW, Fuller RM. 2002. Modeling impacts and costs of gray squirrel control regimes on the viability of red squirrel populations. J. Wildl. Manag. 66:683–697. Rushton SP, Lurz PWW, Gurnell J, Nettleton P, Bruemmer C, Shirley MDF, Sainsbury AW. 2006. Disease threats posed by alien species: the role of a poxvirus in the decline of the native red squirrel in Britain. Epidemiol. Infect. 134:521–533.